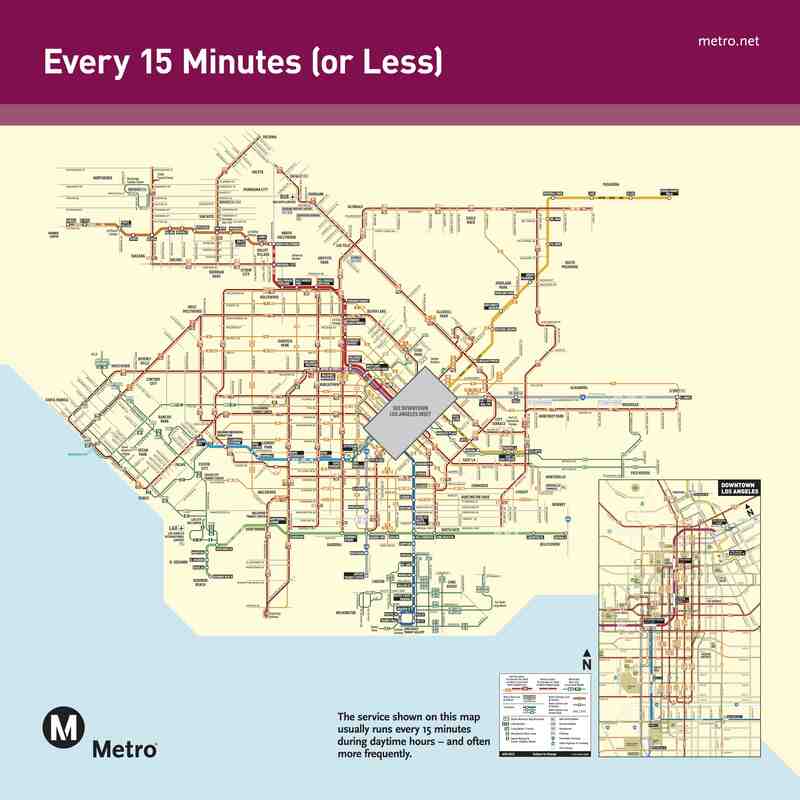 This map shows Metro bus and rail service that runs every 15 minutes or less during the day. Click above to see larger. From March 23 to about April 26, crews will close Coldwater Canyon Avenue, from Ventura Boulevard to Mulholland Drive, from 8:30 a.m. to 7 p.m. Mondays through Fridays and 8:30 a.m. to 6 p.m. on Saturdays. This project is part of a major improvement project to upgrade the city’s water infrastructure. Due to the narrow road conditions of Coldwater Canyon Avenue and the need to use heavy equipment to excavate the road, remove and replace pipe, the thoroughfare must be completely closed to traffic to ensure the safety of the crew and the public. During overnight hours and on Sundays, one lane in each direction will be open. Details of road closures and alternative routes will be discussed at the press conference. There are some transit work-arounds for those traveling between the Valley and Beverly Hills, namely using the Red Line to travel between the Valley and Hollywood. During rush hours, trains run every 10 minutes from the Valley headed south to Hollywood and downtown Los Angeles. Here’s the timetable. On the Valley side, the 750 Rapid Bus serves Ventura Boulevard — with stops at Coldwater — and the Universal City Red Line station. The Orange Line busway also stops at Valley College and Laurel Canyon Boulevard (both near Coldwater Canyon) and serves the North Hollywood Red Line station. •The 780 Rapid Bus stop at the Red Line’s Hollywood/Highland station and travels west on Hollywood Boulevard and then south on Fairfax Avenue through Beverly Hills to the Washington/Fairfax Transit Hub in Los Angeles. •The 704 Rapid Bus stops at the Red Line’s Santa Monica Boulevard station and travels west on Santa Monica Boulevard all the way to downtown Santa Monica. •The Purple Line subway travels west from a shared station with the Red Line at Wilshire/Vermont. The Purple Line terminates at Western Avenue and Wilshire, a major stop for the 720 Rapid Bus on Wilshire. The 720 travels west to downtown Santa Monica, with stops at major cross streets. Here’s another link to see the 15-minute map above. Also worth mentioning, I think, is metro bus 218 which is not a “Rapid” but is a direct route from BH to Studio City, via Laurel Canyon. No auto commuter who normally takes Coldwater Canyon to access Beverly Hills/Westside jobs is going to suddenly resort to sub-par transit service just because of this closure – they will stay in their cars and simply divert to the other canyon roads, the 405, and the 101. So funny that Metro thinks they’ve actually provided an efficient transit alternative to reach Westside jobs from the Valley that can actually persuade anyone to “make the switch”, even temporarily. They will still get to their destinations much faster (and thus cheaper since time is money) via car, even with the increased congestion. Wake me up when Metro gets serious about rail from the Valley to LAX via a route that roughly parallels the 405/Sepulveda Blvd. Not that I disagree with everything you said… but while time is money, MONEY is also money. You can’t only say “it’s faster so it’s therefore cheaper!” The fare is likely cheaper than the gas alone… with the $5 day pass (if needed) being about the cost of one gallon nowadays. And time on a bus or train can also be used to get work done, leading to an overall savings of time (and therefore money). So the solution (the 405 line is still decades away from being a reality) is for Metro to simply offer no alternatives during the closure of a major street? That would be awfully helpful (I wish there was a sarcasm font). Just because a large demographic of car-addicts (and perhaps you, I don’t know) refuse to alter their mode of transit does not mean that Metro should refrain from suggesting options, even if they may not be best or preferred. It’s this kind of negativity that partially keeps people from riding in the first place. The Orange Line does NOT stop at Coldwater. I wish it did!